After the drunken shenanigans of the night before, Rudolph was feeling pretty low. He was disappointed in himself (the kind of disappointed you feel when you are reprimanded by a grandparent, the ultimate shame) and knew that he’d let himself down. The unnamed blonde had left, she didn’t leave her number but she left a tag with her details on. Apparently she was conceived in China and is a bit fussy as she will only bathe if washed by hand. What a Floozy. He should’ve known she was that sort. His nose was redder than ever and was so bright he had to wear an eye mask to try and block out the light so he could get some sleep to get rid of his mammoth hangover. The neighbours must’ve thought the Blackpool illuminations had come to Lapland. After a good power nap, approximately 20 hours, Rudolph was woken by the sound of banging. No, pounding. “What the hell is that? !” He thought. It was coming from the front door. He dragged his antlers out of bed and threw on his cashmere scarf. You can’t answer the door naked now, can you. He grabbed a beer to wake himself up and walked downstairs. Rudolph opened the door and was greeted by the sight of an enormous bloke. He had never met him before but he’d heard all about it as he was the most dreaded ruffian in the whole of Lapland. What the bloody hell does he want this time of night? Wondered Rudolph. “Hello chap! Can I help you?” asked Rudolph chirpily. Oh crap. Blondie was his girlfriend. 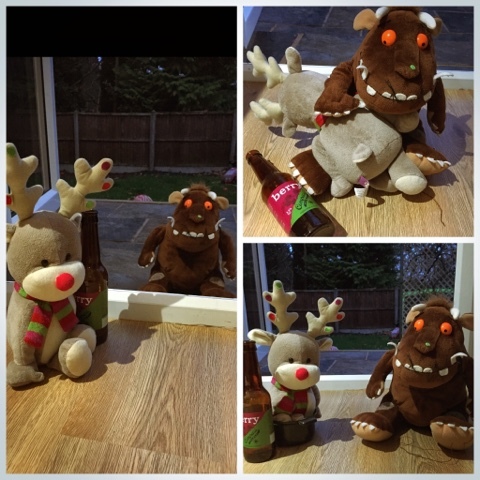 The Gruffalo shoved his way into the house and got Rudolph in a headlock. He punched his head, he pulled at his antlers and he used his nose to light up his watch so he could check the time before carrying on with more punches. “Oh help!!!! Oh no!!!! It’s a Gruffalo!! !” Shouted Rudolph. But no help came. After 10 minutes of brawling, the Gruffalo found a Le Cruset casserole pot and shoved Rudoph in it. “You go near my woman again you overweight excuse for a reindeer, I’ll put this pot on the stove and I’ll cook you. I love a bit of venison”, shouted the Gruffalo. “Alright mate, no worries, understood”. And with that, the Gruffalo left. “Bloody hell, that was close,” thought Rudolph. He vowed to never go near the blonde, hand wash only floozy again. He’d learnt his lesson and had the bruises to remind him. And with that, Rudolph did what he does best. He opened another beer, put the blondes tag in his bedside drawer for safe keeping (well, you never know, he might need it again) and went back to bed. Superb! You do have to watch out for those hand wash only floozies! !